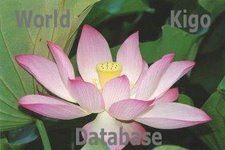 A project of the World Kigo Database. Dr. Gabi Greve, Japan, Daruma Museum. He was 79 when he died. His name was 田庄一郎 and his nickname Yasuke 弥助 or Hanjiro 半次郎. At a young age he left for Edo to work with the money changer Mitsui EchigoYa. 三井越後屋. He climbed to success as their head clark (bantoo 番頭). 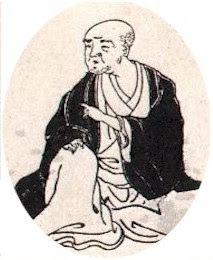 His name in the haiku world, Yaba 野馬, was first mentioned ind 1687 貞享４年. His style was that of karumi 軽み, lightness. He also used the name of Chobokusha 樗木社 or Choshi 樗子. He studied haiku first with Kikaku, later Basho himself. He also compiled the poetry collection "Sumidawara" 炭俵. Later in his life after the death of Basho, Yaba settled in Osaka since 1704. During a great fire in 1724 he lost all his possessions and moved to a hermitage in Takatsu 高津. It is said he had more than 1000 students, from Western Japan, Central Japan and Shikoku. a salt merchant from Hiroshima. ©　More in the WIKIPEDIA ! 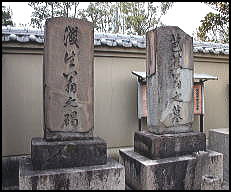 His grave in the temple Shitenno-Ji 四天王寺 Osaka. The fence of the forbidden ground. Written when he got the news of Basho's death. There is also a letter from Basho to Yaba, written during his trip "Oku no Hosomichi", which was found in 1997.
. uguisu ya mochi ni fun suru en no saki . Bashô’s verse breaks drastically with the convention and discovers poetry in the natural and the low. In these words lies the soul of the poem.
. Basho jittetsu 芭蕉十哲 . and the Genroku period haikai　元禄俳諧. of the willow trees . . . Written in the spring of 1694 元禄7年 as the hokku for a haikai meeting with Jokushi 濁子, Yaba 野坡 and others. Basho describes his experience on the way to the meeting.
. . . ASK ME . . .
. . . ASK ME . . . any question about the WKD or Japan !